A vast country like India with a huge network of rivers and interconnecting canals could ordinarily be an ideal place for an efficient inland waterways system as it has multifarious economic advantages and is the cheapest mode of transportation. However, this potential could not be tapped as developing inland waterways as means of passenger and cargo transportation, has never been a part of the planning until recently. As a result, burden on the road and railways networks went on piling and they became over stressed. Let us have a look at the river connectivity potential of the country. The country has been divided into 20 river units that include 14 major river basins. The remaining 99 river basins have been grouped into six river units. The poor planning and neglect of this sector over the decades is reflected by the fact that the Ganga-Brahmaputra-Meghna basin which covers 34 per cent of the country’s area contributes about 59 per cent of the water resources. The West flowing rivers flowing towards the Indus covering 10 per cent of area account for a mere four per cent of the resources while remaining 56 per cent of area contributes 37 per cent of the runoff. Clubbed with this geographical picture is also the fact that India has 7,551 kilometer coastline and about 14,500 kilometer of navigable inland waterways. This huge potential has by and large remained unexploited despite the universal acceptance of the fact that waterways transportation is fuel efficient, environment friendly and more economical as compared to rail and road. As the current scenario stands, the Inland water transport (IWT) has only less than a 1 per cent share of the total goods transported within the country through various modes such as rail, road and water. This is much less in comparison to other nations which are similarly blessed with such a vast river network. Let us compare ourselves with our immediate neighbour China with which we tend to compete both on economic and industrial fronts. As against our 14,500 kilometeres of navigable inland waterways China has over one lakh kilometeres of well honed waterways. This scenario is significant both from the public and planners point of view when fresh efforts are afoot to develop inland waterways. The idea behind this endeavour is to provide relief from the choked road and railways network with a cheaper option that has the potential to help the economy particularly in the rural sector. This fact has been corroborated by Shipping and Surface Transport Minister Mr Nitin Gadkari who has been a strong votary of developing inland waterways. “National highways are very important. But waterways are most important,” he had stated recently in Parliament while seeking passage of the National Waterways Bill, which has now become an Act, during the Budget Session. The importance of his statement in relations to the waterways development could be better understood through comparatives with other nations. For instance in China, 47 per cent of goods and passenger traffic is on water while in Korea and Japan, 43 and 44 per cent of goods and passenger traffic respectively is on water. In European countries, 40 per cent of goods and passenger traffic is on water. Where does India stand vis-a-vis these nations which are currently dominating the economic firmament of the world and India wants to play a competing role? 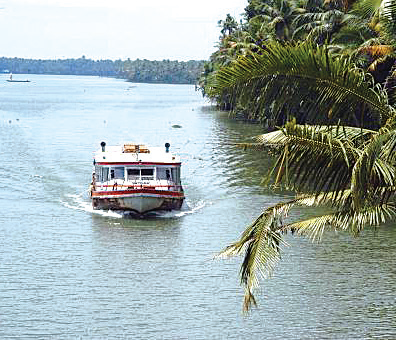 India accounts for just 3.5 per cent goods and passenger traffic through inland waterways. Covering this gap will be a huge task due to poor state of the rivers and infrastructure. Nevertheless, Mr Gadkari views inland waterways as game-changer in terms of increasing exports and reducing cost of goods as well as passenger traffic. It is not that Mr Gadkari is the first one to realise the potential of internal waterways as means of transportation. The need for its development had been felt earlier also but all efforts remained on papers only. Mr Gadkari is the first one to lay thrust on a planned movement. Since Independence many expert committees studied the Inland Water Transport area and advocated systematic development of the mode. National Transport Policy Committee in its report (1980) accordingly recommended for setting up of an Authority for development and regulation of inland waterways. This led to formation of Inland Waterways Authority of India (IWAI) in 1986 for development and regulation of inland waterways. The present Government plans to set up 30 water ports on Ganga itself to make reality the premise that travelling by water costs much less as compared to road or train travel. It may be noted that road travel costs approximately Rs 1.50 per kilometre while travel by railway is pegged at Rs 1 per kilometre. It is a mere Rs 0.25 per kilometre if one embarks on the waterways. This is just sample of the more ambitious plans which the Government has drawn for developing the inland waterways. It includes developing 2000 water ports and Roll-on-Roll-off (Ro Ro) services which will be available at five select places to transport goods and vehicles, across the country. Under this scheme Varanasi, Haldia and Sahibganj will be developed as multi-modal hubs with linkages to roadways, waterways and railways. A much bigger challenge for the Government’s plans to succeed on this front lies in ensuring the physical viability of water flow in various rivers. That would entail that the rivers maintain a particular level of water flow which has drastically gone down over the years due to overuse under intense population pressure and industrial and agricultural requirements. The regular flow of rivers has also been affected by the construction of dams up-streams. Going by the yardsticks set up by the Inland Waterways Authority of India, a minimum, consistent year-long water depth (water draft)of two meters has to be maintained along the national waterways to ensure uninterrupted transport. This is a daunting task given the present status of river pollution and lack of policy and planning on judicial use of river water. This is one area which is still devoid of proper research to enable developing a more feasible model of water retention. Some experts strongly feel that 1.5 meter water draft could be a more realistic proposition and its operational viability needs to be tested. Apart from the water draft levels, there are other related needs for making the waterways operations efficient and viable. This pertains to technological requirements that include developing small jetties, channel markings, night navigational aids as also deployment of GPS and river maps and charts for navigation. Although the National Inland Navigation Institute, Patna, has been entrusted with the task, it is still a long way off. Maintaining water levels is an intensive cost proposal as it requires river training, dredging and navigation. This would be required for a particular variety of river beds while in other cases periodic maintenance of river banks and time to time dredging would be required to maintain the required depth and flow of water. These steps are necessary to ensure that river maintenance remains at a consistent level so as to provide a sufficient depth for the vessels that are expected to ferry along. The cost could vary from Rs 8 to Rs 11 crore per kilometre on each bank depending on the topography and urban or rural settings as the river stretch passes through. Up till now five waterways have been declared as National Waterways. These include Ganga -Bhagirathi-Hooghly river system ( Allahabad-Haldia- 1620 kilometers) as NW-1, River Brahmaputra (Dhubri-Sadiya- 891 kilometeres) as NW-2, West Coast Canal (Kottapuram-Kollam) along with Udyogmandal and Champakara Canals- 250 kilometeres as NW-3, Kakinada-Puducherry canals along with Godavari and Krishna rivers (1078 kilometers) as NW-4. The NW-5 consists of East Coast Canal integrated with Brahmani River and Mahanadi delta Rivers (588 km). Of these, NW-1, 2 and 3 are operational in certain stretches and vessels are moving on them. They have developed a fairway of required depth and width, terminals with cargo handling facilities and navigational aids. NW- 4 and 5 are yet to be made operational. According to the Ministry of Shipping and Surface Transport, the draft National Perspective Plan (NPP), prepared under the Sagarmala Programme, has recommended priority development of National Waterways-1, 2, 4 and 5 to enhance port connectivity to the hinterland. This in turn would enable faster and cheaper movement of key cargo types such as coal, iron ore, food grains etc. The National Waterways Bill, 2015 which was recently passed by the Parliament and became an Act also makes a provision for declaration of 106 additional waterways as National Waterways. The process to prepare Techno-Economic Feasibility Studies/ Detailed Project Reports for identified new waterways has already been initiated. The real extent and scope of developing these waterways will be known after completion of these studies. Developing entire spectrum of Inland Waterways would require substantial funding. As of now, provision of an amount of Rs 284.52 crore was made in 2015-16 (Revised Estimates) Budget. This has been increased to Rs 350 crore in 2016-17 Budget allocation. The funding part remains to be a major area of concern which is reflected in these meagre sums kept only for study purposes. The Government still has to come out with a comprehensive financial plan for the Inland Waterways development. However, the Minister Mr Gadkari has repeatedly assured that money would not be a problem. In this connection he pointed to financial resource of over Rs 1 lakh crore would be garnered soon for the development and augmentation of the Inland Waterways and coastal shipping. Already polluted rivers remain to be an area of concern and this has led to the states expressing fear that regular movement of traffic on waterways would further compound the problem. To allay these fears the Centre has decided to set up a River Traffic Control System on the lines of Air Traffic Control system. The other area of attention would be to operate the cargo steamers and other vessels on clean fuel. In this connection, LNG (Liquified Natural Gas) is being considered as the ultimate fuel. Yet another impediment which also has the danger of assuming political overtones of the nature of Centre-states disputes relates to the jurisdiction of water as a subject. The subject matter relating to Inland Water Transport falls in all the three lists of the Seventh schedule of the Constitution of India. The exclusive jurisdiction of the Central Government is only in regard to shipping and navigation on inland waterways declared by an Act of Parliament to be national waterways. Shipping and navigation on other waterways with respect to mechanically propelled vessels falls in Concurrent list whereas navigation by vehicles other than mechanically propelled vessels is exclusive jurisdiction of State Government. The issue did crop up during discussion on the Bill with Members from the Opposition parties expressing fears that the states’ jurisdiction over territorial water rights would be muzzled. Allaying their fears, Mr Gadkari assured that new law will not infringe upon their rights. This in fact would boost the maritime trade of the states and help boost economy. The Government has also announced some incentives for carriage of some portion of cargo by coastal shipping and inland waterways instead of by rail and road. This is being done with a view to make waterways an integral part of the country’s logistics chain. This is one of the most significant steps taken by the Government, in recent times, to boost the inland waterways system and coastal shipping and develop it as a viable alternative to road and rail. It entails compensating the costs incurred in availing the first-mile and last-mile connectivity for goods that have the potential to be moved by waterways. The scheme proposes to provide monetary incentives to beneficiaries when they transport certain identified commodities, containerized cargo or automobiles, on Indian flag vessels, on trips having either a major port (owned by the Union Government), a designated non-major port (owned by the state government) or a terminal/jetty owned by the Inland Waterways Authority of India (IWAI) as the point of loading or discharge. This is the just the beginning of the process of realizing the huge potential of Inland waterways and would go a long way in easing pressure on the over stretched traditional modes of transport.